The Best Yoga Teacher blogs from thousands of top Yoga blogs in our index using search and social metrics. Data will be refreshed once a week. Yoga Teacher newsletter is a comprehensive summary of the day's most important blog posts and news articles from the best Yoga Teacher websites on the web, and delivered to your email inbox each morning. To subscribe, simply provide us with your email address. Facebook fans 1,679. Twitter followers 843. Netherlands About Blog EkhartYoga.com offers high quality online yoga & meditation classes so that you can enjoy yoga anytime, anywhere. You'll find classes for everyone, from absolute beginners to experienced practitioners and qualified yoga teachers. Facebook fans 10,565. Twitter followers 1,657. Facebook fans 10,139. Twitter followers 150. Facebook fans 4,964. Twitter followers 78. Facebook fans n/a. Twitter followers 736. Goa, India About Blog The sole vision of AYM yoga ashram in Goa is aligned with the integration of yoga and its relevant philosophy into the daily lives of people thereby creating a distinction from other Yoga schools in India that provide yoga training in India . We pride ourselves in conducting the best yoga teacher training in India through Our Own Yoga schools. Mysore, Karnataka About Blog Samyak Yoga Blog is considered as one of the Best Yoga Blog Mysore India with its wide range of subjects from Asana practice, Pranayama, Asana Anatomy, Yoga Philosophy, Patanjali's Yoga Sutras, Hatha Yoga traditional Practice etc. Facebook fans 4,959. Twitter followers 936. About Blog Connecting community and virtual neighbors through live online yoga and meditation classes. We believe in authentic human connection through yoga and meditation. Dana Point About Blog WELCOME to Fightmaster Yoga, I'm Lesley Fightmaster. I believe free yoga classes can be available to everyone! If you love yoga, come do a teacher training with me!! Facebook fans 14,890. Twitter followers 2,365. About Blog Want to get better at AcroYoga? Daniel Scott can help. Daniel Scott is yogi provocateur with a fresh alternative to the traditional "yoga voice". His classes are a lively mix of balance cut with improv, strength and flexibility-- Daniel focuses on moving into postures, not through them. An E-RYT 500 globally renowned ashtanga-vinyasa teacher and Certified Level 2 AcroYoga instructor. New York City About Blog A New York City yoga teacher and teacher trainer with a masters's degree in applied physiology, I teach anatomy and physiology for yoga teachers and other practitioners around the country and worldwide. I'm also a Feldenkrais Awareness Through Movement teacher, Certified Strength and Conditioning Coach and movement science geek. Downers Grove, IL About Blog We teach yoga in a safe, relaxed and open environment. Here is where fundraisers are given & friendships form. Here is community. Here is yoga... among friends. 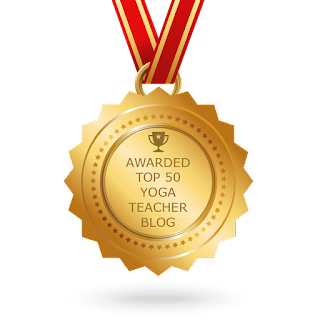 CONGRATULATIONS to every blogger that has made this Top Yoga Teacher Blogs list! This is the most comprehensive list of best Yoga Teacher blogs on the internet and I’m honoured to have you as part of this! I personally give you a high-five and want to thank you for your contribution to this world.